It is becoming increasingly difficult for young moms to keep up with a 9-5 job, away from their young children. Even more so if they are raising their children on their own. On top of that, childcare costs are increasing and are sometimes just too much to afford, in order to keep your full-time job. This is causing moms in this position to stay home, in the company of their kids. Unfortunately, being a single mom requires a steady income, which poses an obvious problem. It can be a tough decision, whether or not you keep your day job or make the switch to a full-time mom and Kaeser & Blair understands that it is important to make the best one, when it comes to impacting your kids. 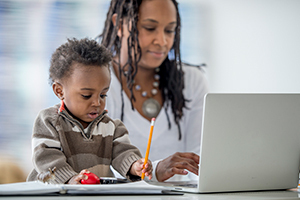 If you’ve worked hard to get where you are and wish to maintain the financial stability you’ve earned -- while also raising your children at home -- Kaeser & Blair’s stay at home mom jobs are the perfect opportunity for you. You no longer have to wonder how you will balance work, finances and taking care of your children on your own as K&B has all the answers. Becoming a business owner with Kaeser & Blair offers freedom and flexibility that you will not find anywhere else. As a single mom, you’re already the boss -- but our stay at home mom jobs provide you the opportunity to be your own boss, too. You can work as little or as much as you need right from your dining room table. Further, your earning potential is totally up to you and you can devote as much time as you’d like to selling promotional products; a K&B distributor who works full-time can make up to $185,000 annually. Our unbeatable profits are just one of many reasons to be satisfied with K&B, another is that we let our business owners stay in control. As mentioned, our stay at home mom jobs allow you to choose your hours and your profit, but in addition to that you are not required to sign any binding contracts and can run your business the way you desire. As a well-educated mother, it is beneficial for you to know that you are in complete control and can implement your own tactics into your business. If you’d like to join the Kaeser & Blair family, you can purchase our Standard Business Owner Package today, for only $85, and start taking full advantage of our stay at home mom jobs. This package includes everything you need to get started, as well as a training program to help you navigate the system. Still unsure? Request our FREE TRIAL LAUNCH PROGRAM today and see for yourself why Kaeser & Blair’s business owner satisfaction is so high for moms, like you.